DETROIT -- In addition to his career at Ford Motor Co., Harold "Red" Poling was involved in many volunteer and fundraising projects in Southeast Michigan. 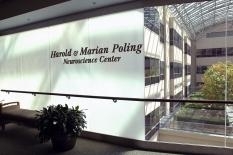 But one stands out: the Harold & Marian Poling Neuroscience Center at William Beaumont Hospital in suburban Detroit. Poling was motivated by his family's experience: His wife, Marian, and daughter, Pam, both suffered brain aneurysms. Both survived, but their experiences with neurological disease motivated Poling's involvement in raising money for the neuroscience center. Besides his gift of $5 million, in 2004 Poling was chairman of Beaumont's Neuroscience Campaign and raised nearly $15 million. The Neuroscience Center is a project of Beaumont Hospital and Detroit's Henry Ford Health System to provide treatment for neurological illnesses. It includes a 66-bed inpatient care unit and a surgical learning center. In 2004, Poling helped raise more than $6 million for Detroit-based Cornerstone Schools by organizing the Arnold Palmer Turning Point Invitational Dinner. Poling held leadership positions with many nonprofits, including Detroit Renaissance Inc., United Way for Southeastern Michigan, New Detroit Inc. and Boys and Girls Clubs of Southeastern Michigan.